Fred Klotzman furnished this letter saying it had been dictated by his mother Mary Klausner Klotzman to his older sister Betty around 1940. Betty used her skills taking "shorthand" dictation and then typed the letter. Its full text is shown below. 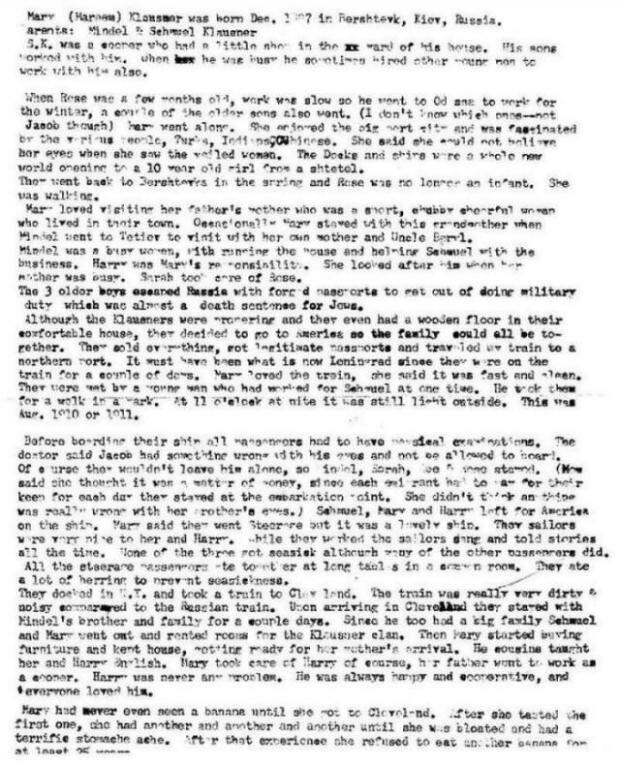 To view a scanned copy of the two-page letter, see below. Mary (Mareem) Klausner was born Dec. 1907 [ed. actually 1896] in Bershtevk, Kiev, Russia. Parents: Mindel and Schmuel Klausner. S.K. was a cooper who had a little shop in the yard of his house. His sons worked with him. When he was busy he sometimes hired other young men to work with him also. When Rose was few months old, work was slow so he went to Odessa to work for the winter. A couple of the older sons also went. (I don’t know which ones – not Jacob though). Mary went along. She enjoyed the big port city and was fascinated by the various people, Turks, Indians, and Chinese. She said she could not believe her eyes when she saw the veiled women. The docks and ships were a whole new world opening to a 10 year old girl from a shtetl. They went back to Bershtevk in the spring and Rose was no longer an infant. She was walking. Mary loved visiting her father’s mother who was a short, chubby cheerful woman who lived in their town. Occasionally Mary stayed with this grandmother when Mindel went to Tetiev to visit with her own mother and Uncle Beryl. Mindel was a busy woman with running the house and helping Schmuel with the business. Harry was Mary’s responsibility. She looked after him when her mother was busy. Sarah took care of Rose. The 3 older boys escaped Russia with forged passports to get out of doing military duty which was almost a death sentence for Jews. Although the Klausners were prospering and they even had a wooden floor in their comfortable house, they decided to go to America so the family could all be together. They sold everything, got legitimate passports and traveled by train to a northern port. It must have been what is now Leningrad since they were on the train for a couple of days. Mary loved the train, and she said it was fast and clean. They were met by a young man who had worked for Schmuel at one time. He took them for a walk in a park. At 11 o’clock at night it was still light outside. This was August, 1910 or 1911. Before boarding their ship all passengers had to have physical examinations. The doctor said Jacob had something wrong with his eyes and not be allowed to board. Of course they wouldn’t leave him alone, so Mindel, Sarah, Abe and Rose stayed. (Mom said she thought it was a matter of money since each emigrant had to pay for their keep for each day they stayed at the embarkation point. She didn’t think anything was really wrong with her brother’s eyes.) Schmuel, Mary and Harry left for America on the ship. Mary said they went steerage but it was a lovely ship. The sailors were very nice to her and Harry. While they worked, the sailors sang and told stories all the time. None of the three got seasick although many of the other passengers did. All the steerage passengers ate together at long tables in a common room. They ate a lot of herring to prevent seasickness. They docked in N.Y. and took a train to Cleveland. The train was really very dirty and noisy compared to the Russian train. Upon arriving in Cleveland, they stayed with Mindel’s brother and family for a couple of days. Since he too had a big family, Schmuel and Mary went out and rented rooms for the Klausner clan. Then Mary started buying furniture and kept house, getting ready for her mother’s arrival. The cousins taught her and Harry English. Mary took care of Harry of course. Her father went to work as a cooper. Harry was never any problem. He was always happy and cooperative, and everyone loved him. Mary went to school for about 2 years then went to work in a shop running a sewing machine and then attended night school. Before the year was over, Mindel decided the shop was not for Mary. She was needed at home, and the men were earning a good living. Mary was then the sewer for the family. She made dresses, night clothes, shirts and pants. I have no idea where she learned. She followed patterns and also combined them to get the effect she wanted. She met Isadore Klotzman (Issie) through her friend Ida who was Issie’s younger sister. Ida later married Carl Kupersmith. Issie was the only son of Esther and Sholom Klotzman who came from Tetiev (Mindel’s home town in Russia). Issie also had an older sister Becky who married Morris Kaufman. Issie was born May, 1894. 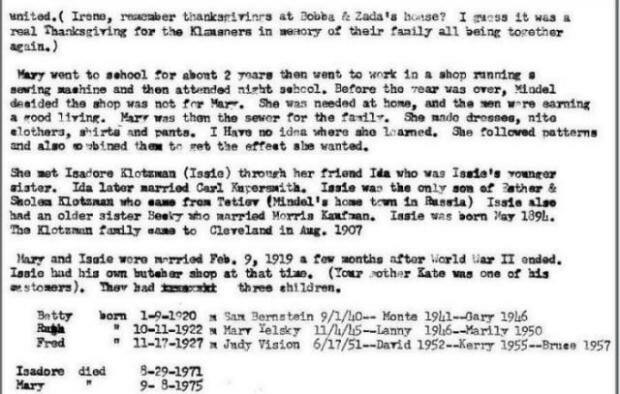 The Klotzman family came to Cleveland in Aug. 1907. Mary and Issie were married Feb. 9, 1919 a few months after World War II ended. Issie had his own butcher shop at that time. (Your mother Kate was one of his customers). They had three children. Note that the dates at the bottom of page two were added later, with another typewriter.